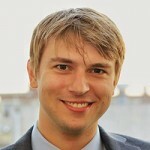 Jayson Tischler is a Principal at Rittenhouse Ventures, an emerging-growth venture capital firm based in Philadelphia, PA. Rittenhouse invests in Mid-Atlantic, capital-efficient software companies that power enterprises in healthcare, life sciences, human resources, finance, and general business services. As venture capital press coverage glorifies the hunt for unicorns, being the biggest is now synonymous with being the best. Big venture funds are praised for investing in big rounds at big valuations. Venture financing is getting top-heavy. In the first quarter of 2016, 10 companies received 25 percent of all venture investment. Across every fundraising stage, median deal sizes have steadily risen. Because venture funds continue to grow, they face increasing pressure to find bigger investment opportunities in a finite startup market. Entrepreneurs often raise large rounds because investors are willing, and increasingly eager, to fund large rounds, not necessarily because that is the best growth strategy for the company. Many startups have a valid expectation that they are judged by the amount of capital they have raised. Revenue and customer data are often undisclosed, especially for the most promising companies. The default gauge of success then becomes the most salient signal available—size of investment. Big fundraising rounds imply more capacity to rapidly expand, more attractiveness to employees or customers, and less time to grovel. Companies are run by people, who are not immune to the financial and reputational cachet that comes with mighty fundraising rounds. Yet, for most startups, more money in does not mean more money out, or any money at all. Median exits for venture-backed companies have historically fallen within a range of $30 to $110 million. As the 2:6:2 industry adage goes, for every ten companies, two will fail, six will perform moderately, and two will thrive. The amount raised in each round and across the company lifespan has to incorporate these exit values and exit probabilities. Not every company will be the next runaway market leader. Not every founding team will end up with a blockbuster payout. Usually, less is more. Venture-backed companies can improve their financial outcomes, strategic options, and reputation by choosing the right amount of capital at the right time. One way for start-ups to reach successful financial outcomes is to take the capital they need to raise instead of what they can raise. In doing so, entrepreneurs require the right venture partners—those who appreciate that they can maximize returns with targeted, effective fundraising rounds. Take an illustration of a promising company taking an equity investment from VC Less (VCL). This VC leads a non-preferred Series A round for $2 million at a $6 million pre-money valuation, or 25 percent post-money ownership. In a subsequent financing, VCL invests an additional $3 million to keep its pro-rata share. With the company growing from its own sales revenue and only $5 million raised from outside capital, the founders take an exit offer for $80 million. With 25 percent ownership, VCL receives a $20 million payout, or a 4x return. As a median outcome for the venture fund, that is successful. For the management team, $60 million is probably life-changing. An alternative approach is to take that same example and make it bigger. VC More (VCM) aims to invest $5 million in the same company’s Series A at a $10 million pre-money, or 33 percent post-money ownership. After negotiating, the company accepts a lower ownership percentage for more money, assuming the capital will last longer and drive a larger exit. In another fundraise, VCM invests $7.5 million to keep its pro-rata share. To reach the same 4x return multiple, VCM’s payout must be $50 million, requiring the management team to hold out for a $150 million exit. In this scenario, venture-backed companies should prefer less money to more money. Dilution erodes the ownership stake of startup management teams. The entrepreneurs give up 33 percent ownership to VCM and only 25 percent to VCL. With $80 million and $150 million exit values, the company takes home $60 million with VCL and $100 million with VCM. An 88% increase in exit value is needed for a 66% increase in the entrepreneurs’ financial outcomes. If the company does not sell for a higher exit value after taking the larger fundraising round, VCM’s additional dilution further empties the founders’ pockets. VCM may also prevent an exit until the desired 4x multiple is reached. More outside capital requires more challenging growth in meeting higher exit thresholds. If participating preferred terms are involved, bigger investments come with even bigger risk. In an exit, the investor gets paid back its investment first. Only then do ownership percentages apply for distributions of the remainder. In the example, VCM gets paid back $12.5 million and VCL receives $5 million, taken off the exit price. With $137.5 million and $75 million remaining exit values, these terms only reduce company payouts by about $8 million with VCM’s investment and $4 million with VCL’s. However, in downside scenarios, large investments with participating preferred terms can wipeout company management entirely. If the extra $7.5 million in invested capital from VCM only results in the same exit value as with VCL, the company receives just $45 million instead of $56 million. In an exit scenario of only $40 million, entrepreneurs walk away with only $18 million with VCM’s terms and $26 million with VCL’s. The additional outside capital with more dilution is not always aligned to entrepreneurs’ outcomes. The odds are stacked against big exits. In 2015, it is estimated that fewer than 180 companies exits had a price greater than or equal to $110 million. Given the total number of eligible venture-funded companies (of which many fail completely), exits above $110 million represent no more and probably much less than 15-20% of venture-backed companies. Startups looking to raise big investments now may lose on outcomes later, if they are not the exception. 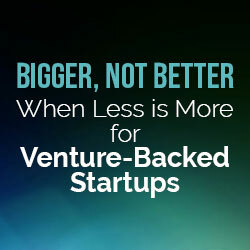 The implication of bigger rounds are higher exit requirements that come with bigger risk for the startups. Less capital can be the right amount of capital for companies that want to maximize likely returns. Unpredictability for entrepreneurs can be mitigated by focus and flexibility. Tapping the fundraising gas pedal can prevent reckless growth strategies and inefficient spending. In business-to-business sales, speed is less essential than thoughtful strategy and validated quality. In direct-to-consumer businesses, effective go-to-market plans can be just as important as first-mover advantages. Companies should prioritize raising the right amount of investment to reach break-even, in order to grow organically from strong sales performance. Competitive pressures may hasten the need for capital, but each fundraising round should be highly targeted. Entrepreneurs should set clear growth milestones and keep their options available, as the company will grapple with new challenges and opportunities. It is appealing to seek the prestige of a big fundraising round. However, managing a business requires demonstrable results, from initial investment to exit. Companies are stewards of shareholder and customer dollars. Being careful with expectations and over-delivering on outcomes builds trust. Continuing to grow valuations by reaching revenue milestones is difficult. For potential acquirers or the public market, a consistent track record carries a premium. Big successes can be swiftly erased by a single big miss. Venture-backed companies face a real temptation to take the largest fundraising offer. It requires resolve for entrepreneurs to stick to a focused strategy—an investment in sustainable growth. As some companies are seduced into becoming unicorns, opportunity will only keep getting bigger for those who do more with less.